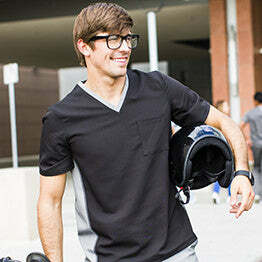 The “Cross My Hip” scrub slack is a stylish pant that blurs the lines between workwear and performance wear. Structured to keep up with your physically demanding lifestyle, this pant is both functional and flexible. Our stretch shape enhancing fabric offers the comfort of your favorite athletic pant with the tailored drape of a slack.